Mimi Plus Two is Whitney Dineen’s hilarious, entertaining and insightful chick lit fiction tale of a young American woman embarking on pregnancy and marriage into a British aristocratic family who are in the US. Mimi finds her life changes bit by bit as she progresses through the nine months, works out how to deal with her in-laws, and makes adjustments to her new life without losing herself. Mimi’s and husband Elliot’s families couldn’t be more different, or so she thinks. She is expected to give up her beloved little home and live in a mansion sized property, and take on a nanny (fortunately she finds quirky and artistic Abbie for the role and the two become friends and allies). Then, as events unfold, poor Mimi develops postpartum depression, which causes her to believe the end of the world is nigh, and her alien reptilian husband and in-laws are in on it. I thoroughly enjoyed this page-turner of a novel. Written in first person present tense, with the delightful and hilarious Mimi telling the story, the book romps along at a good pace. The plot has plenty of surprises in store for the reader and kept my interest throughout. Whitney Dineen creates well-defined, unique and believable characters. I loved Mimi’s sense of humor and her positive take on events. She even gives her painful bunion a name and character all of its own! Mimi is very likable and I felt drawn into her changing and challenging world. Her marriage to Elliot occurs after a short, whirlwind romance and so the story is in many ways an exploration of the relationship between two people from very different backgrounds as they really begin to discover each other – and their families – and make adjustments. Amongst the fun and mayhem there is another theme, though, as Mimi embraces her pregnancy with all its discomfort and the unexpected disruption it causes to her body, and then the distressing postpartum illness. This, of course, is no joke and Mimi finds ways to calm herself and find hope of this ending in time. While her paranoia and alarming beliefs and behavior are presented in a humorous way, I liked the fact that she is brave enough to reach out to others for help and support. So perhaps the book will prompt more thought, openness and discussion about this condition. 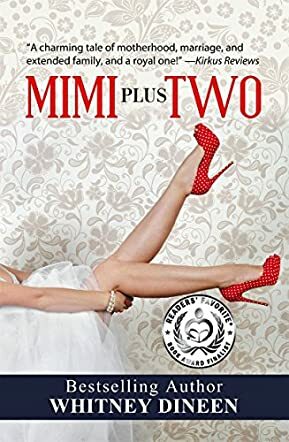 Mimi Plus Two is a well-written and entertaining story that will keep fans of women’s fiction and chick lit engaged to the end. Recommended.